Over the past ten years utilities globally have been using new technologies across the value chain to extract value, defer investments and improve customer satisfaction. In this piece we highlight the digital imperative for the industry and how utilities can optimize their digital strategies. Indeed, digitization is at an inflection point in the sector, where a trend of technological convergence is taking hold. Over the next decade developments in artificial intelligence (AI), distributed ledgers (blockchain) and advanced control algorithms will impact a variety of sectors. For utilities, these trends combined with the dramatic changes in the energy transition such as distributed energy resources, increased proliferation of sensors on infrastructure and behind the meter devices and demand management advances will unleash a variety of transformative use cases in the sector. In terms of opportunity and shifting digital energy landscapes, three data points help illuminate the size of the prize. Firstly, digitization can have a significant impact on utility profits. For McKinsey, conservative estimates suggest that digital optimization can boost utility profitability by 20% to 30%. Secondly, the digital business case for reduced power system costs is significant, with the IEA predicting that overall savings from digitization could be in the order of USD 80 billion per year over 2016-40, or about 5% of total annual power generation. Finally, in terms of overall market opportunity, BNEF forecasts the market for digitization in energy is sector set to grow to $64 billion by 2025. There are many factors that are driving a digital revolution in the industry. 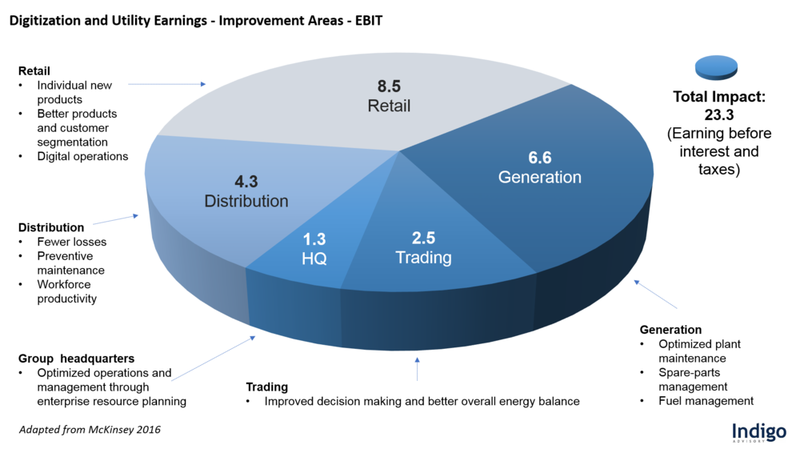 In the diagram below, we advance Indigo's “5 D” framework that highlights the broad set of transformational areas that are impacting traditional utility business models. It is true that these factors are largely interrelated, however, in many ways digitization holds the keys to unlocking the potential across decarbonization, disintermediation, decentralization and decreasing consumption. Digitization is both a significant backbone and enabler of the energy transition allowing for new business models, revenue streams and ultimately value for both customers and utilities. Naturally, these “D’s” vary depending on geography, jurisdiction and unique utility characteristics, however, having a thorough understanding of the impact of various regulatory, technological and financial trends is a first step to building a robust digital utility strategy. By taking this approach utilities can examine their capabilities, new technology requirements and core systems that currently serve the market. 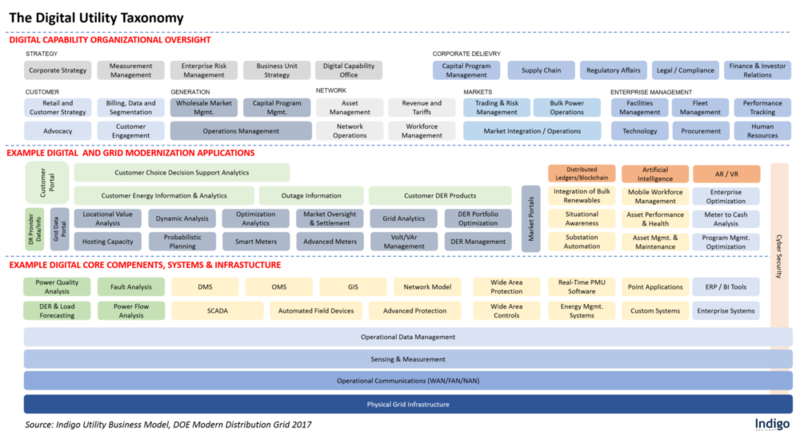 In the diagram below, we expand on the analysis of the DOE’s Modern Grid work beyond distribution and customer facing components by examining an illustrative value chain that includes for example, enterprise and headquarter activities. A framework like this can serve as starting point to explore core components of the digital value chain and therefore the need for technical and capability market scans. This exhibit is of course illustrative and it is well noted that each utility has its own unique characteristics, operating models and regulatory regimes. The important point here however is to identify the components that will inform a digitization strategy as a starting point, both from a functional and technical perspective. Once a utility has mapped their unique components, looking across each area and asking common digital questions that are contrasted to market developments, organizational investment opportunities will become apparent. The reason why a holistic digital assessment at this stage is key, is due to the fact that over the past decade successes relating to the deployment of smart grid and digital infrastructure has been mixed across the industry. While some utilities have seen a rise in customer engagement, lower operational costs and the launch of new products and services, others have struggled to prove out original business cases and functional requirements. One of the leading reasons for this is an under-investment in the development of customer and business led use cases. When a market becomes technology led, and predominantly driven by stakeholders other than the end user (in the case of the digital grid, end users are both customers and utilities) it loses sight of design thinking and primarily focuses on technical builds. For utilities, lessons learned in this space range from leveraging vendor business cases too heavily in their analysis, failing to quantify unique utility and customer characteristics and inadequate post-implementation strategies. In a similar vein and from a technology perspective, tackling the foundational items first is critical. For example on the data front, while it is true that up to 80% of data is unstructured in an organization and work is always needed on clean-up, data acquisition itself may be a bigger problem. In this regard and for example, critical sensor deployment considerations should include -- what assets should and can be monitored first, do we have the right level of data quality to implement a solution and should a solution be hosted or provided as a service by a vendor etc. In a similar vein, many utilities have several point applications that could be rationalized and maintain current systems with functionality that can be turned on to satisfy digital business requirements without investment in larger platforms. With this in mind, while the minimum requirement for digital partners in this space are those who understand the technology stack, vendors which are market leading in the energy sector also understand how to engage functional teams of engineers, operators and customer facing staff. Once a utility has mapped out the digital layers and identified its underlying digital architecture, next it is important to identify what digital capability and applications are ready for deployment, what’s for R&D and where utilities should partner. In order to achieve this, market scans from a technical and functional perspective are crucial. In the diagram below, we aggregate the findings of the DOE Grid Modernization report on distribution grid technologies to show the relative maturity of some of the emerging technologies. The technology adoption cycle X-axis, “Current Adoption,” identifies the stage of adoption for a specific technology. The horizontal dashed line represents the crossover point from stages that are Preoperational (i.e., under test and/or evaluation) to those designated as Operational (i.e., proven and in production use). Phases of maturity differ by specific technology, but all technology undergo the same five phases. Moving beyond these areas, we see that many new business models backed by distributed ledger technology (blockchain), artificial intelligence (AI), and new advanced control algorithms are certainly still at the R&D stage, and as such utilities are and should remain in exploration mode on this front. One way to achieve digital prowess in the innovation market however is to further partner with startups, indeed, we are seeing a host of activity in terms of acquisitions by utilities at the grid edge over the past number of years. Also in this domain, for regulated foundational digitization activities, coordinating efforts across jurisdictional entities will serve power providers and customers well by ensuring consistency and standardization across the sector, an example of this can be seen in the joint technology investment plans of New York’s utilities. Outside of technological maturity, the IEA for example, believes there are few barriers to the deployment of digital technologies in the electricity sector compared with most other energy sectors. The primary reason for this is that companies that own and operate power plants have direct financial incentives to invest, as they benefit directly from fuel cost savings, reduced O&M spending and the competitive advantage of lower overall operating costs in the wholesale market. However, they do note that misaligned financial incentives can present a significant barrier for fully exploiting the potential of data and analytics in electricity networks. This is especially true in regulated markets where total investment in physical assets is the basis of revenues, while investments in digital technologies are not incentivized. Encouragingly however, over the past number of years we have seen a move to clear the path for capitalization of certain digital infrastructure components such as cloud investments, which will gradually permeate through the industry and help with adoption rates. In the diagram above the IEA highlight where digitization’s potential impact in oil and gas, coal, and power resides. The table highlights the magnitude of impacts on productivity and efficiency differ across applications in supply sectors where “Barriers to digitization” include technological, financial, regulatory and public perception components. The creation of digital utility business cases with detailed sensitivity and NPV analysis including the assessment of alternatives is a crucial step to define recovery options and align the business to a benefits realization approach. We learned a great deal from the last wave of smart grid investments and how to build effective business cases with real results. Critical in this step is to examine unique utility characteristics and use many of the learnings, available resources and market expertise to build a robust customer centric model. Each component of the capability and application model outlined in this piece should be assessed individually and holistically as very often in a utility business case for various projects, benefits are double counted. For example, when looking at building a digital monitoring and diagnostic center any business case should mirror the use cases deployed and include -- extended asset life, improved productivity of assets, reduced impact of catastrophic events for electrical assets and a host of type 2 benefits such as increased customer satisfaction from reduced outages, faster recovery from security events/outages, higher quality analysis of incident data etc. However, these benefits are often counted in other digital component areas such as further sensorization, communications networks and other point applications, as such aggregating benefits across a digital program is critical. As we mentioned earlier in terms of opportunity, three interrelated data points help illuminate the size of the prize. Looking holistically at the impact of digitization across a utility, including process at the enterprise level, McKinsey point out that digital opportunities to improve operations and increase flexibility are available throughout the value chain. Conservative estimates supported by analysis of real-life cases suggest that digital optimization can boost profitability by 20% to 30%. They observe that utilities can realize most of this potential by three means: smart meters and the smart grid, digital productivity tools for employees, and automation of back-office processes. In terms of digitization of back office processes they suggest that significant variation among retail providers in cost per customer, the cost of resolving errors, and billing inquiries exist. Indeed in one case, a company digitized a single core process and cut process costs by 20% in the first year while also improving customer satisfaction. The key drivers were higher-quality data and effective process automation. The diagram below highlights where these potential benefits reside across the value chain. As we pointed out in our “5 Ds” model earlier, decentralization and customer participation in energy markets is a significant driver for change across the sector and enables flexibility across power markets. Indeed the business case for flexibility supported by digitization could save USD 270 billion of investment in new electricity infrastructure that would otherwise have been needed to ensure security of supply according to the IEA. By 2040, 1 billion households and 11 billion smart appliances could actively participate in interconnected electricity systems, allowing them to alter when they draw electricity from the grid. This smart demand response could provide 185 GW of system flexibility – comparable to the currently installed electricity supply capacity of Italy and Australia combined. Significant also in this category are the benefits to be accrued from digital data and analytics where the reduction in O&M costs, improvement in power plant and network efficiency, the reduction in unplanned outages and downtime and the extension in the operational lifetime of assets presents a large opportunity for utilities. As highlighted in the diagram below, the IEA estimates that the overall savings from these digitally enabled measures could be in the order of USD 80 billion per year over 2016-40, or about 5% of total annual power generation costs based on the enhanced global deployment of available digital technologies to all power plants and network infrastructure. A critical component of digitization for utilities is the availability of products and services from both mature and innovative vendors. In this domain we expect to see further ramp up in market provision and sophistication of supply. To this end, BNEF predicts significant shifts in the intelligence of digital technologies used in energy from today to 2025, and a big change in the sectors of the energy system that most benefit from these technologies, with a market for digitization in energy sector to grow to $6 billion by 2025. The shifting landscape of technology provision will be evidenced by both supply and demand of digital technologies where home energy management technologies will see the most significant change in digital revenues, rising from $1 billion in 2017 to $11 billion in 2025. As highlighted in the table below, the largest driver for digital technology revenues in 2025 will be smart meters, growing 44% between now and 2025, to $26bn. This revenue increase matches the fall in digital revenues from fossil fuel O&M – 46% over that time period. As digitization is both a journey and a destination for utilities, it also critical to examine technologies and investment in line with market changes and potential shifting grid end-states. To that end, in addition to a thorough value chain analysis and business case development process, utilities should consistently evolve their views on where their particular organization is heading from a strategic standpoint. This approach will inform no-regrets investments and new business models that could be pursued. A useful way to examine potential scenarios for utility strategic planning is to explore future “end states”. In the diagram below, we borrowed from the DOE’s work to highlight four distinct futures. Consistently monitoring what’s happening in jurisdictions at the ‘cutting edge’ and by forming closer relationships with customers, utilities can discern what end state is becoming more likely and as such refine their digital strategies. 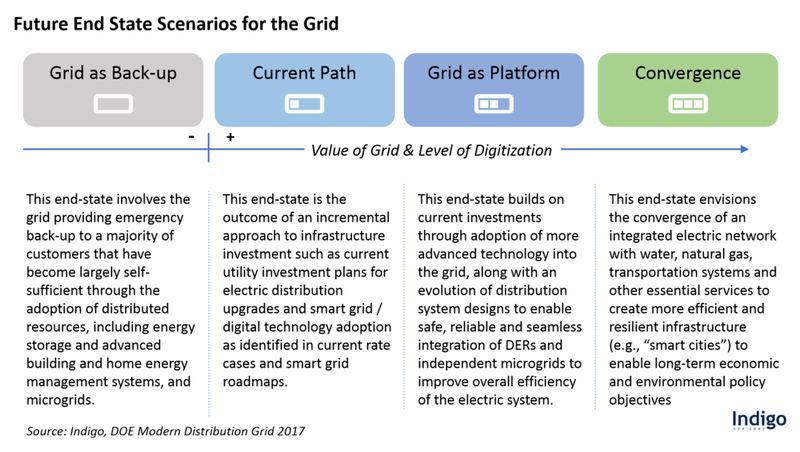 Across each of these potential end states the value of the grid increases and the need for investment by a utility in digitization becomes increasingly more significant and intricate. Building on the above end states framework, in the diagram below, we highlight illustrative strategic themes that utilities could pursue towards the idea of digital innovation and a convergence strategy. Core in this journey is to pursue level 1 and 2 and monitor 3 as a direction setting objective. Creating a digital blueprint for a utility is critical as very often various component parts are developing at different speeds, albeit to an aligned vision. A digital blueprint should complement a detailed application and capability assessment and business case development process as highlighted in this piece. Indeed, while digital technologies offer an array of opportunities to improve performance for the benefit of individual companies, the system as a whole, energy consumers and the environment, it is the connectivity component of digitization that has the potential to reshape the power sector. In a journey towards digital innovation and convergence and moving beyond a purely platform model, utilities can enable huge transformation by connecting new products and services with key demand sectors such as transport, buildings and industry. While the pace of change is accelerating across the sector, this is a multi-decade digital transformation journey and the intersection of energy across all sectors needs to be consistently examined for innovative opportunities. In addition, it will also be critical to manage domains such as cybersecurity, privacy and economic disruption in the most equitable and robust way possible. There are many factors impacting a utilities business model currently, however, building a digital strategy and implementing it effectively is perhaps the greatest opportunity that utilities can control. By taking a holistic value chain approach backed by a robust business case and evolving view of the future, utilities can ensure they future proof digital investments. It is becoming clear that the greatest transformational potential for utility digitization is the ability break down boundaries between energy sectors, increasing flexibility and enabling integration across entire systems. Those utilities that lead in digital transformation will be undoubtedly best placed for future challenges and opportunities.